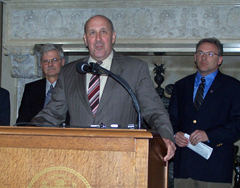 Governor Jim Doyle announces legislation which cuts state government spending by $125 million dollars – part of effort to close Wisconsin&apos;s budget gap. The governor says the legislation will mean across the board cuts by state government agencies in Wisconsin, and will result in a $700 million reduction in the state&apos;s current budget gap. Doyle says the state&apos;s overall budget crisis – a shortfall in the current biennium of more than $5.7 million – has not been helped by the federal stimulus negotiations. “What the Senate did, and what they really have sort of forced the House to do, is going to be much more difficult for us.” The cuts announced by Doyle and legislative leaders will resolve just a portion of the budget gap. 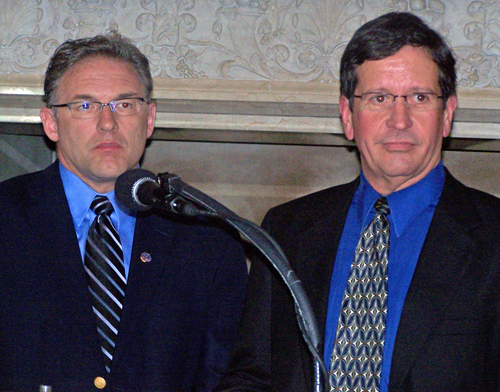 Legislative leaders, Assembly Speaker Mike Sheridan and Senate Majority Leader Russ Decker , expect to have the legislation on the governor&apos;s desk by next week. They also say they&apos;ll have the state&apos;s biennial budget completed on time. The cuts will include $500,000 by the State Legislature. The legislation prohibits any reductions to highway construction activities. It also reduces health care costs and expands access by securing $900 million dollars in new federal revenue through an assessment on hospitals, according to Doyle&apos;s office.